Welcome to Advantage Printing & Design... We make you look good! At Advantage Printing & Design you’ll find the right printed product to meet all of your marketing, sales, billing, delivery, inventory and ticketing needs while saving time and money. We offer all types of business products and our personalized services help you stay organized, manage your records, act quickly and get noticed. Contact Advantage Printing today for a quote, product samples or if you have any questions or comments. You only get one chance to make a great first impression, so make the most of it with professionally designed letterhead, business cards and forms. This is one of the easiest ways to reinforce your business identity, enhance your image and get one cohesive look and feel. Few marketing tools are as versatile as a classic tri-fold or quad-fold brochure, which can be used to get your featured products and services directly in the hands of customers and prospects. Or use postcards for quick announcements and special offers to keep your business in mind. 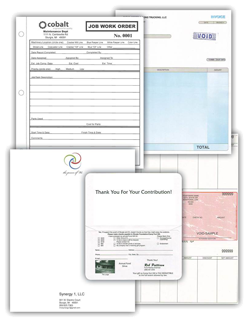 We offer a complete line of Marketing products to make certain they remember your name! Plus custom printed specialty items for any promotion or event. 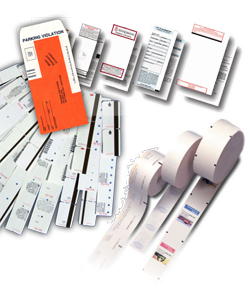 Whether it’s paper ticketing or receipts in roll, fanfold, short or long run, paper or synthetic, Advantage Printing offers years of experience in the this specialized product field. From parking tickets and envelopes, parking garage spitter tickets, to ATM receipts including any type of mobile printing need, we supply guaranteed product to meet your equipment specifications. Simple, attractive graphic design in a piece leads to effective advertising. At Advantage Printing you'll be involved throughout the entire process helping to shape the direction and final outcome. 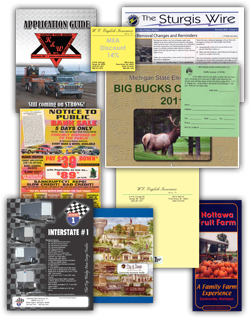 Advantage Printing offers full design services from concept, through the proofing stage and final product. We also offer commercial photography services, either on site or in studio, making Advantage Printing truly one stop for your creative ideas. From logo creation to brochures, folders, catalogs and promotional pieces, you'll find our design services affordable, professional and functional to get your message out clearly. We are a company who is dedicated to making sure that your invitation experience is stress free. We promise to provide the fastest service in the industry, maintain the highest quality printing standards and ensure your complete and total satisfaction. Our website offers quality invitations in a variety of prices to meet every budget. You can also customize these invitations and make each one unique to your theme or personality by changing the ink, wording and lettering style. You can "Design Your Own" look, preview it online and then be assured that our staff will thoroughly review your order before it gets printed.